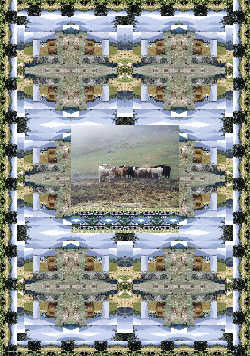 Click quilt to see larger image. 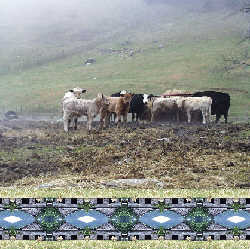 Log cabin block used for quilt Quilt is made from photographs I shot of my neighbor Grady's farm just after hay was cut in June. It uses the Log Cabin block. 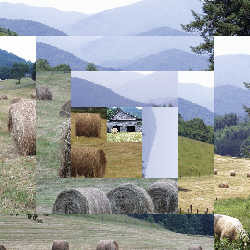 I was especially pleased with the look of the stripe beneath the center cow image which was made from a picture of Grady's barn and the undulating curve in the border made by the mountains. website and images copyright 2007 Barbara Webster. All rights reserved.